A failure, unfortunately, was Totò's encounter with one of the masters of Italian cinema in one of his rare sorties into the field of comedy, a genre that was not congenial to him: DOV'E LA LIBERTA? (WHERE'S FREEDOM?). 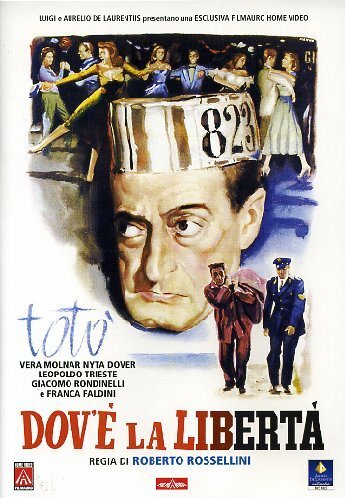 Written by Rossellini with Antonio Pietrangeli, this paradoxical story tells of a man who, set free after years in jail, escapes in the opposite sense, demanding, that is, to be put back in prison because the modern-day world has been an utter disappointment. The film lacked pace and the contribution of the actor, however excellent, fails to compensate for the inconsistencies and discrepancies of the plot. UN TURCO NAPOLETANO (A NEAPOLITAN TURK: 1953), MISERIA E NOBILITA (POVERTY AND NOBILITY: 1954) and IL MEDICO DEI PAZZI (THE DOCTOR OF THE MAD: 1954) represented three mediocre attempts by Mario Mattoli to recreate on the screen the charm of Naples between the 19th and 20th century on the basis of three famous plays by Scarpetta which were part of the classical repertoire of the Neapolitan theater. But Totò seemed somewhat cramped by the restrictions of the roles not created for him.